So what DO I like about V-8's, two valves, and push-rods? The packaging (shape) of the V-8 is very good - It's by far the best configuration of an engine with more than four cylinders, as it takes up the least amount of room and tends to have less vibration than an in-line engine. I also reckon they sound just lovely when revved hard, such as the Aussie 5 Litre Touring Car series, or Nascar's, etc. This is, of course, purely a function of the number of cylinders, and nothing to do with the valve actuation. FWIW, one of the best sounding engine's I've ever heard was a small block Chevy with a 'flat plane' crank in a speedway Sprint Car. 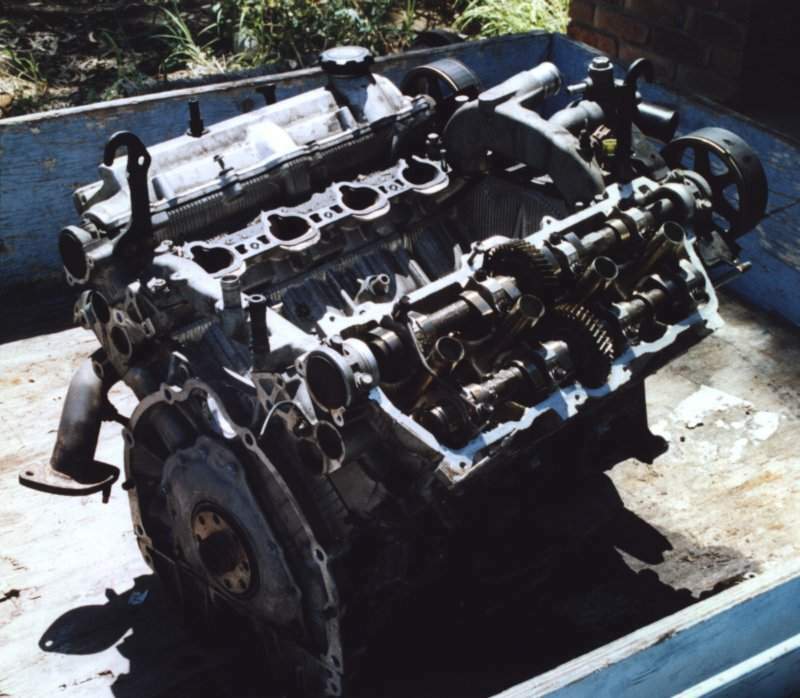 One of the best mass production engines around is the Toyota Lexus V-8, which is 4 litres, has four camshafts, and four valves per cylinder. It's a lot like two Toyota 3SGE's joined together at an angle, as they share similar bores & strokes. The engine is used in the luxury Lexus car, and also in the more sporty Soarer. It's built so it has good torque at all revs, and also so it has very little vibration. Because of this it's down on power compared to what it could be, and I reckon with some minor mods it could make an easy 100hp per litre, or 400hp. To get 400hp out of a Ford/Holden/Chevy 5 litre V-8 isn't hard, but they would be far less pleasant to drive and use a lot more fuel as well. As for two valve engines - especially push-rod ones - the only time I want to see them is in a museum, or on a chain with a boat at the other end! Some years ago, it was suggested that the Suzuki Swift GTi (or sometimes called the Cultus in Japan) 1300cc engine would make a good addition to the available engines for the Sports 1300 racing cars in Australia. The rules then only allowed for a single cam two valve engine, so ultimately there would have to be a rule change to allow the Suzuki's to be used. To keep them reliable, they needed to be rebuilt every year, ie, new con rod bolts, new piston rings, refurbish the head, etc, at a cost of about Aus$500 or so. Whenever the head is refurbished, a small amount is skimmed off it to ensure a nice, flat sealing surface. 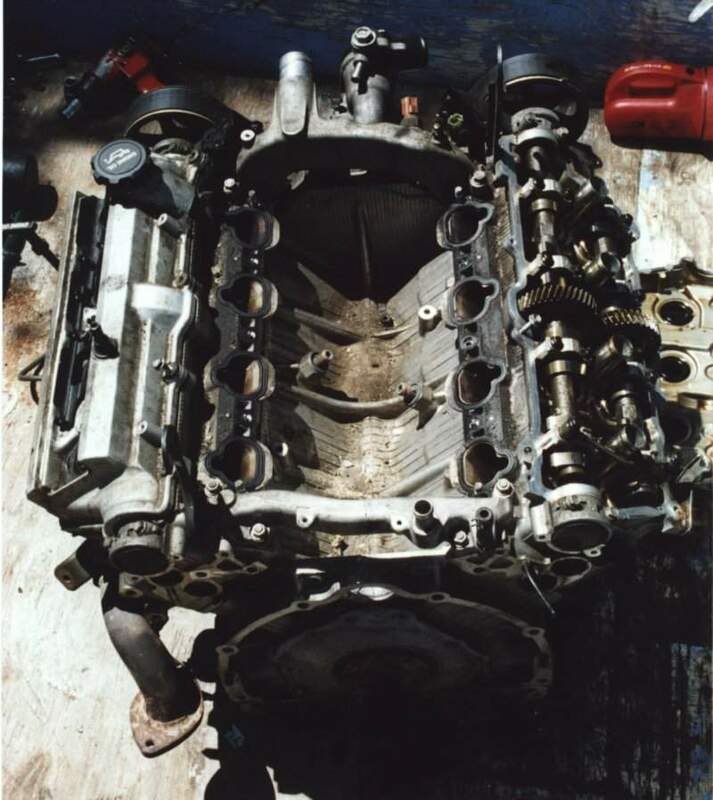 This means a limited number of rebuilds before needing a new head, as they are very thin to begin with - due to the high compression ratio - and so after about five rebuilds or so, the head must be replaced with a new one. The cost of a new head to be prepared to full race specs is over $1,000, so it's certainly a consideration for costs. I ran a 3K Corolla for a number of years, and the only real trouble I ever had with it was the valve gear, ie, it occasionally had a push-rod fail, a valve spring retainer let go, etc. Fortunately, I never dropped a valve into the top of a piston, but I think it was just a matter of time. This is about the point where the naysayers started to make a lot of noise, and after a little thought we agreed with them - If an unrestricted Suzuki was allowed into the class, all the single cam engines would be made obsolete overnight - At great expense to the owners! So, it was decided to make a Suzuki with 135hp to be a 'parity engine' to the 3K's & A12's. It ended up being rather surprising how little work had to be done to the Suzuki to get it to make 135hp - I'll give the specs below. So there you have the details - To get the same amount of power, the twin cam engine is basically only a warmed up road engine, whilst the 3K is a highly stressed full-race engine. 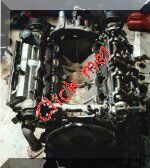 Note that with the three main restrictions of compression ratio, specific camshaft, and rev limit, it is very difficult to get more power from the twin cam, so the restrictions are quite effective. You can do pretty much what you like with the valve sizes and head porting, etc, and you'll not really get any more from them, only shift the usable power band around. There's a few companies that make engines that have three inlet valves and two exhausts, giving five valves in total. Since we've clearly found out that four valves are much better than two, would not five valves be even better? 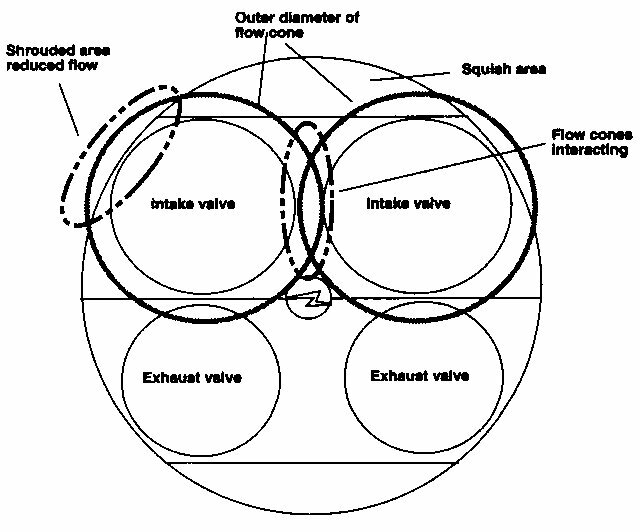 - Not really - Yes, you get even more valve open area, and yes, you have even less inertia per inlet valve, but there are problems with the airflow into the combustion chamber and also the reduced size of the squish areas. Squish areas are an important factor in producing good power and it's very difficult to get decent-sized ones into a five-valve chamber. One problem that multi-valve heads have is that the area between the valve tends to get a 'dead' area for the airflow, thus limiting airflow between the valves. 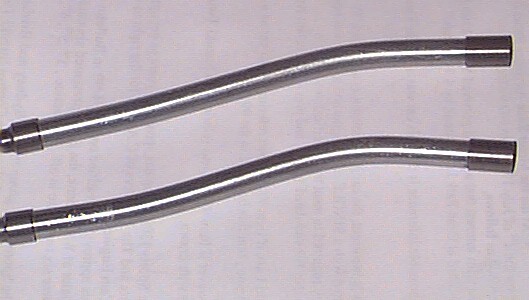 With a five valve head the inlet valves are usually about the size of the exhaust valves, and so the middle inlet valve has two dead spots, one on either side, thus limiting flow. The flow bench only tells part of the story though, as it can really only show relatively slow airspeeds. At high airspeeds (eg, mach 0.4 or so) the effect is worsened. They also have relatively poor squish areas compared to four valve heads. So, they in fact don't make as much power as a good four valve head can - Case in point being the efforts of the Formula One engineers, who tried for a number of years to get the five valve heads working, but always ended up going back to the four valve versions. These particular engines are rated by Toyota at between 165hp and 170hp (though in practice it's more like 145hp odd) ) which is a good ~20hp more than the four valve versions. After having a think about it, I reckon that the main reasons for this extra power is actually due to the VASTLY better inlet manifold (Like a pair of twin Weber carbies) and a narrower included valve angle. (down from 45° to about 35°) I think that the cam timing is a little more aggressive as well, once the VVT system is working, thus giving more power. Another interesting point is that from several different sources I know of that have tested a 20v on an engine dyno say that the engine doesn't make anything like the 165hp odd that Toyota claim - More like 145 - 150 hp or so ... In addition to that, the best power figures I've even seen from any source for a modified one is about 215hp. The 16v versions can make 245hp with some small restrictions, so you can see that the 16v head is the way to go. (FWIW, the 16v engine is a LOT cheaper to modify) Read my 4AGE pages for more info. The above specs are possibly the best way to demonstrate the differences between a modern twin cam and an old fashioned push-rod engine. 100hp per litre is very, very easy to get out of the twin cam, and relatively expensive & short lived from the old engine. It's no different at all for engines of any size - though big, as in 4+ litres, twin cam engines are hard to find, so the 5 litre V-8's still tend to dominate the big engine scene. It's really a shame, as I think you'll agree that with modern engineering it would be quite possible to have a 500hp 5 litre V-8 these days that would meet all the emission criteria, be even more driveable than the old types, and generally be a heck of a lot more fun than the old types. I still personally prefer smaller engines, as all of my cars are relatively lightweight and also don't have the room for a physically big engine. I think that the best way to go is to use a turbo on a small engine if you want more power, as it combines the best of both worlds - when driving 'normally', you have a small engine, but when driving hard the extra air makes the engine behave like a big one, so you can get the fuel economy of a small engine but still have the performance of a big one. But turbo's are another story. I guess this is proof that I'm not biased - Here's a picture of my latest engine puchase, a Toyota 1UZ-FE V-8. They come standard with a six bolt bottom end (that's six bolts for each main bearing cap), quad overhead camshafts, twin knock sensors, and have an alloy block & heads. It's going to be going into the back of my Dad's Sport Car. 1. The engine has to be 'big'. Just how big we weren't able to settle on, but something like larger than five litres or so seems to be reasonable. 2. The engine can't rev hard. Again the crossover point wasn't really found but it's somewhere around 7,000rpm odd. 3. The 2v engine has to use quite a large, aggressive cam. Take away any one of those and the 4V engine is a better thing. We also agreed that even with a good 4v head it's going to be larger than a good 2v head, a little heavier, and more expensive to build/buy. So for a typical muscle car you'd be better off most times with the typical V8, such as an LS1, etc. For many other applications the 4v engines will be a better thing. It's also far easier to have fully variable cam timing on a twin cam engine, as you can move the lobe centre on each cam aroud independantly, which gives a wider spread of torque. "First off I agree with most of what Bill has said, 4 valve engines simply allow better cylinder filling at all RPM, this translates to improved BMEP and therefore increased torque and BHP throughout the rev range. 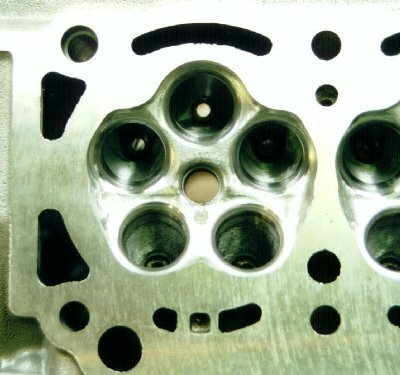 I would say that a 4 valve engine in aspirated form, developed properly will make about 90ft/lb per litre tops and can sustain most of this for around 50-55% of its rev range, an 8 valve engine developed properly will make no more than 82ft/lb per litre and can sustain most this for no more than 40-45% of its power band. This means that a stonking 4 valve engine will be far more flexible and have a wider torque envelope that an 8 valve.. end of story, where you choose to make that torque is up to you. Effective cylinder filling at high RPM (and therefore big BHP) comes at a price on an 8 valve engine, the price is wild cams and lots of overlap, these destroy low down torque. 16 valve engines have inherently better cylinder filling because of increased valve curtain area, to extract greater power requires less cam duration and less overlap than with an 8 valve, this allows better retention of the engines low down torque characteristics. I've run my current engine in 8 valve and 16 valve form, both times running relatively enormous cams (8v 326deg, 16v 302deg) with ultra big valve heads and 48 webers, the 16 valve version produces 70BHP more and comes on cam 1500RPM earlier, at 2500RPM the 16 valve has *twice* the torque of the 8 valve. Peak torque on the 8 valve was 155ft/lb, on the 16 valve 179ft/lb. From 3500 to 8300 I have over 85% of maximum torque on the 16 valve, on the 8 valve torque hits 85% of maximum at 4400 and drops below again at around 7200. Thats why I changed to 16 valve.. Here is a real example from a big rolling road day at Walkers workshop on Sunday 15th, two engines, one an 8 Valve 'Kent' Crossflow, 1780cc, fully worked big valve head, 296 degree cam 40 Webers and 4->1 exhaust, the other a 16V Rover K series 1788cc, standard head, standard plenum, 268 degree cams, 4-2-1 exhaust. Speaks for itself... at 1500 RPM the 16v has 24% more torque, at 2500 the 16v has 29% more torque, at 4000 18% more. These are real life engines, no theory here, in order to match the 16 valves output the 8 valve has to use a lot more cam and a big valve head fully reworked. This has worsened its low down torque. The output from the 8 valve is considered very good for a road engine too. A naturally aspirated 1788 K series 16 valve engine fully reworked (by me) was on the dyno today at Walkers Workshop and made 251BHP and 163ft/lb of torque (90ft/lb per litre). See it in CCC magazine next month, show me an 8 valve aspirated 1800cc engine with those sort of power and torque figures and I'll show you my testicles on a silver salver. So there you go - ALL my engines are twin cams, and I'm never turning back.